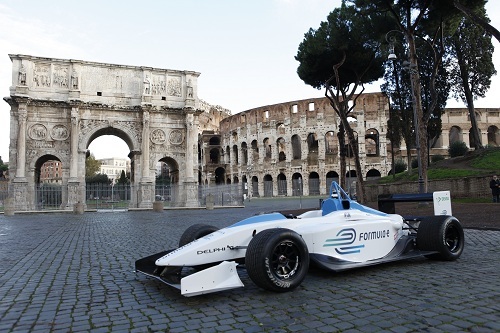 Rome announced as the second city to hold a FIA Formula E race in 2014. On December 1st, at Campidoglio, the Mayor of Rome – Mr Gianni Alemanno, President of the Fédération Internationale de l’Automobile (FIA) – Mr Jean Todt, Formula E Holdings CEO – Mr Alejandro Agag and Chairman of the Italian Automobile Club (ACI) Mr Angelo Sticchi Damiani, announced that Rome would be the first European city to host the FIA Formula E Championship in 2014. Formula E Holdings has signed an agreement with the FIA to promote the new Formula E Championship, featuring Formula E cars powered exclusively by electric energy. Rome becomes the second city in the world to welcome the FIA Formula E Championship following Rio di Janeiro’s announcement in August this year. In total, the 2014 inaugural Championship will feature 10 urban races. FEH has already received interest from a large number of cities to host the ‘E-Prix’. FEH will soon define the list of venues that will be proposed to the FIA for the first season. Further city announcements are expected in the coming weeks. In November, McLaren announced it would design and build the powertrain for the first Formula E cars in consortium with Spark Racing Technology (SRT), a new company led by Frederic Vasseur. Formula E has declared itself as an ‘open’ championship. It has been working to encourage other car designers and constructors to build a Formula E car. The FIA technical regulations, to be published soon for the Championship, will ultimately set the framework for making such submissions possible. To ensure the availability of cars for the first year, FEH has ordered 42 cars from SRT for the 2014 Championship.